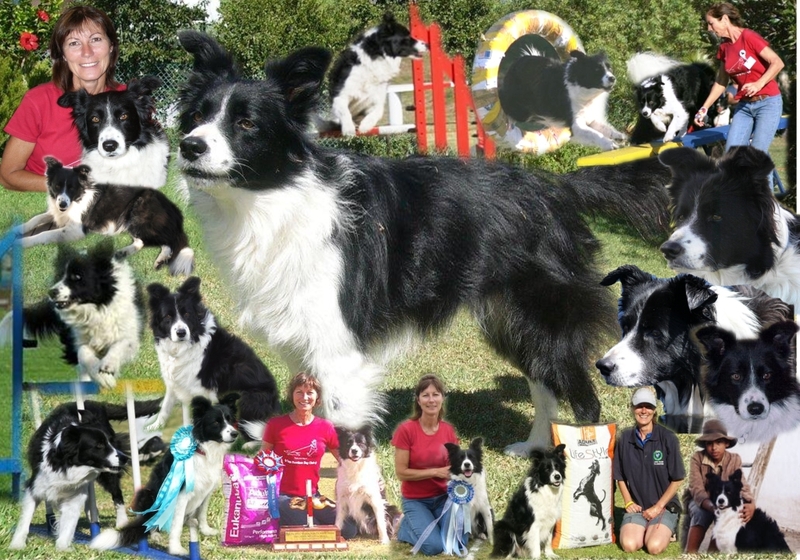 A very real story about a tri-colour, blue eyed, Border Collie who made it back from Neverland. Mac and I rescued each other when he was already 9 months old. Terrified of life, this abused Border Collie has surprised many with his will to live and ability to rebuild trust. Born on the 10th May, one of 4, Gucci arrived home 8 weeks later. An ‘almost image’ of her dad, Q-Pid, Gem-u-Mine Gucci is a King’s Y-Ed’s Miniature American (Australian) Shepherd, and resembles a miniature Bernese Mountain Dog puppy. Quite the little speed demon she will try outrun Macc to get to whatever is thrown and if she doesn’t get there first, will then just take it from him anyway and get the reward for retrieving! He, of course, has been extremely tolerant and has now twigged on that he can play with her. (A perfect opportunity for Nicolette to step in once again and train “Macc’s turn and Gucci’s turn” like she did with Emma and Amie). Kit-Kat has turned out to be Gucci’s best pal – must be a size thing - and he now comes to have his ears preened daily by her. Trying to keep her out of water during all the rain has probably been our biggest problem as she likes to dig and create mud puddles which endears her to the Twins. She still needs to spend more time with them to know they are more than OK to be around because strangers are daunting and she does not appreciate being fawned over and/or cuddled. This 4-month old fluffy bundle is now the largest of both litters (8 pups in total) and the best of fun; the very reason why people need puppies and dogs or any animal to be a part of their lives, and I’m looking forward to happy times together. I had no idea if being a single dog would have any effect on Mac but it was noticeable. He started withdrawing and seemed to spend more time on his own in the study. He stopped coming into the bedroom and I realised that the only time he had ever come into the bedroom was when Emma was already there. I decided to give him some time as I was just too miserable to work him out and for the second time around, we were healing each other. The acceptance did not take long and right now the single life for him seems very attractive. He has grown emotionally and his confidence has sky-rocketed! He stands alert (albeit in the passageway) when he hears Charlie’s car come down the driveway and then goes to lie down for the inevitable biscuit. He gets hysterical when the twins are here, wanting to play with them but nervous of them too and he plays volley ball with all of us. He progressed from staying out of sight in the study to lying on Emma’s cushion behind the couch. As soon as I heard him creep to this spot I would throw treats over the back of the couch to land where he was lying. (If we got up he would scuttle back into the study) until I invited him back. Next month will be the 5th anniversary of Mac’s arrival and he now lies at our feet in the lounge - a massive breakthrough and a wonderful feeling over something usually so normal. Final hurdle: he will seek me out on his own accord instead of me always inviting him. The thought of a new puppy is a constant in the back of mind. My husband would prefer not to get another dog but if I really have to ............ “then it has to be a Border Collie, a puppy, so no dog with a history please”. The other members of my family would also like me to get a BC as I’m a Border Collie Person - what is that? I have already turned down a choice from 3 BC litters so what is holding me back? “You will know when it’s the right dog!” Really? How? Why? Will I find a BC that has been as perfect as what I have and have had? Is a big - (slightly larger than small but not a Great Dane) dog the answer for me? I really struggled with lifting Emma; Over 60 and with compromised strength in my arms, suggests a smaller dog might be the better option and why is my family dictating what breed I should get when a working dog is my main criteria? Time is passing and my ‘Emma shadow’ is missed on a daily basis, but I know the new dog, whatever, it is, will be the right dog for me, I hope it finds me soon, Mac needs a pal. “You’ll know when the time is right”. “She’ll tell you when it’s time”. “Sooner rather than later”. Just 2 weeks after her 16th birthday and 4am in the morning, Emma was awake and trying desperately to get up. This was unusual as she usually slept dead until I woke her at 7 each morning and the carpet was a particular surface that she usually managed to get up on without help. I picked her up and carried her out on the lawn. She just couldn’t get up and remain standing without me supporting her. I cradled her on the lawn until the sun came up and those expression filled eyes told my tear filled eyes that she was very, very tired! Thinking she might have had a small stroke I visited the vet the same morning. She was diagnosed with a lot of pain in her back and neck. Cortisone shots, heavy meds, and the inevitable daily dose of Rimadyl to be started the following week. If she was no better after 2 days a blood test was suggested - maybe her cancer had spread? (She was diagnosed with cutaneous haemangiosarcoma 1 ½ years previously). The days that followed were physically and mentally exhausting. I started setting my alarm for 5am so that I could take her out before she wet herself (missed it once/twice during the day); her sticky paws (fantastic invention for pets and slippery surfaces) were on almost permanently now. I retrained her to sleep in the study (laminated and confined). This was already a nail in her coffin after sleeping next to my bed for 16 years - but a new carpet - I’m so sorry Em! She was unable to position herself after I’d lifted her into the back of the car so on one occasion she fell out when I turned away too soon. Although still weighing at my prescribed under 20 kg (a svelte 17 kg. ), she had become dead weight and my frozen shoulder was taking strain as was my back and neck. The tension was not only physical but also tangible in the house. Charlie knew the time had come but I could not face it and took it out on him. Her aging process consumed me - every waking moment it was foremost in my mind (and I wasn’t getting much sleep, so this was a lot of minutes). I needed to consider how the Boys were going to be told and how they were going to accept it, I needed to consider Tori arriving home to prepare for her wedding and all the USA and local guests that were going to be in and out of the house and all the time I was not going to be at home and able to take care of Emma when she needed me. The only time Emma was chirpy was at agility training - she was able to stand up unaided on the grass and this was the only time she barked for my attention. All Emma ever wanted was to be with me 24/7 and this was now compromised as she was unable to follow me around the house. With virtually no grey hairs and a coat that had improved with age, I realised the night before the appointment that I was making the right choice. Thank you for giving me the world of Agility Em. You were a special friend, but Ascii is waiting to slobber all over you. Happy Valentine’s Day, my wonderful Border Collie. The SADAA Boland Regional Trials weekend kicked off really well. I had opted to enter Snooker only on the first day, (there are less obstacles of choice than in Gamblers), and he clinched his 3rd Grade 2 qualification to put us into Grade 3. The next day he clinched 4 clear rounds, earning a bronze medal for one of them too. The third and last day, he was still rearing to go, but my memory genes were playing up and forgetting how I had walked some courses, handled really badly. Clearly I should have been putting myself though some sort of “handling rehab” at the same time he was going through physical rehab. His contacts are right back to slow mode again so I need to build up his confidence on those again – but he never missed a single one. His speed is definitely slower than pre-op but I should be able to push him in the new year. My Agility Academy partners were wonderfully supportive with my revised “competing regime”. Ten minutes warm-up walk and then another ten minute walk to cool him down after he has jumped. This should be routine pre-jumping behaviour for all competitive handlers, but so few of us do it. All this walking took its toll on me and I was exhausted by the end of the weekend. It was especially difficult when I was first on line and had to ask someone else to warm him up – I was so distracted worrying that he had not been warmed up enough that I forgot the course and earned a spectacular DQ. Cherry on the top? – no sign of any stiffness and no limping! The following week included a follow up visit to Dawn Jones – she confirmed that everything was still in place, that he looked great and with a huge pat on the back - signed us off! We also went to Rene for hydrotherapy who took his swimming session into her outdoor pool so that I could transfer it to any other swimming pool. They had him swimming by himself within 10 minutes and we cancelled all future appointments. (A kind neighbour has offered us the use of his pool and it is now his favourite past time). 2013 will be a real New Year for us. I still watch him carefully, too carefully, and worry constantly. I am going to have to step up the Becalms (my homeopathic Valium), concentrate more and be selective in what I enter. Holiday most disappointing. Weather was not great, there was no sun to sit in and being confined to floating on water is not my idea of fun. Devoured a few books that were lying around and even jogged alongside the barge a few times - but what’s the point if you don’t have a dog with you! Being with close friends was the only plus in my diary and it was so good to be back home again! Both my professional house-sitter as well as my daughter and family were good at sticking to the rules; both dogs and the cat were well and Mac never picked up an ounce of weight. We spend a longer time on midi height and eventually progress to maxi height jumping - limited to straight lines with tunnels, weaves, see saw and dog walk. (A-frame delayed until further notice). We progress eventually into Marlize’s classes to test him (and me) on sequences. Marked improvement in his weave pole striding and his Back On Track is becoming my own “blankie”. His tight turns are still causing the odd bar to drop but he seems to be coping better than me. I’m continually watching him and not running smoothly. Not to mention that it’s been a while since I followed numbers! 6 months post-op and a long anticipated visit to Dawn Jones confirms we can enter SADAA Boland Regionals at the end of this month. I now have to relax and work really hard on not being a nervous wreck by continually watching his striding, but at the same time let him be my guide as to what he can/can’t do - I already know what he wants to do. I also have to make sure that I warm him up really well and then cool him down too - something many handlers are careless about. It’s going to be an interesting weekend so watch this space for news of that. Those that have seen him at training are amazed and very glad that Mac is back!! My name is Debbie and I'm an Agility Addict. I'm married to a good man, have 2 wonderful daughters and young twin grandsons. I have 2 Border Collies, a cat who thinks he's a BC and many fellow agility handlers amongst my friends.